The remarks came during a question-and-answer session at the State University of New York at Canton on Friday. The young woman, who was not identified but said she was a freshman at nearby St. Lawrence University, asked Kasich what more he would do as president to help female college students feel safer on campus. 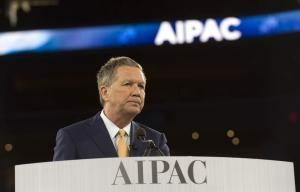 Kasich first responded by touting his record on the issue as governor of Ohio and called for national standards to ensure victims of sexual misconduct or abuse on a college campus have the ability to report the incident to authorities anonymously. The audience responded with applause to the remark but Democrats pounced on the comment. Hours later, however, the Kasich campaign took to Twitter to clarify he did not intend to blame the victims of sexual assault for what happened to them.